$9 Debt Education was created as an easy and cost effective way to participate in post filing debtor education for chapter 7 or chapter 13 bankruptcy/debt relief. The course is just 2 hours in length and can be completed by logging on and off at anytime you're available from any computer with internet access. You do not have to complete this course in one sitting, complete it in as many days as you'd like! 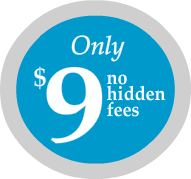 Our program is just $9. This price is far lower than our competitors, but the course is just as effective in helping you complete the post filing debtor education requirements. *$9 Debt Education is approved to provide an instructional course in personal financial management as required under the Bankruptcy code, and approved to issue certificates evidencing completion of a personal financial management instructional course. Approval by the United States Department of Justice does not endorse or assure the quality of a provider's services. Your certificate of completion will be emailed to you, free of charge upon completion of the course. If you need your certificate rushed to you, we can send this to you immediately upon course completion for an additional fee.